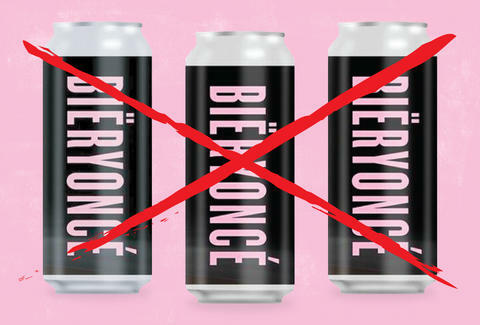 If you're interested in either beer or Beyoncé (read: everyone), you've probably heard about Bïeryoncé, a German-style pilsner from the Brooklyn brewery Lineup Brewing. The beer was originally released in October of 2016, but people were crazy in love with it, so the black and pink cans came back for an encore. Fans have been in formation and they've been drinkin', but Beyoncé just told the brewery to hold up. Lineup Brewing has received a cease and desist letter, according to Pitchfork, so Queen Bey has basically told the company not to say her name (kind of off-brand if you think about it). Call it ego, call it capitalism, but the brewery probably should've waited for the green light. The beer was originally brewed during a Beyoncé concert that owner Katarina Martinez was forced to miss for work, which you'd think would count for something. "As a Hispanic, female run business, I am very inspired by her so I thought I'd pay homage," owner Katarina Martinez told Pitchfork. "We're disappointed she didn't take it as a compliment, but oh well. It was fun while it lasted!" The current run is still available, but not at any old 7/11. You might be able to get your hands on it if you live in New York, but you'll have to act fast. After all, this batch is irreplaceable. James Chrisman is a News Writer at Thrillist who wishes Beyoncé's lawyers would pay attention to him for once. Send news tips to news@thrillist.com and follow him on Twitter @james_chrisman2.